The cybersecurity specialist needs solid results to win back investor confidence. 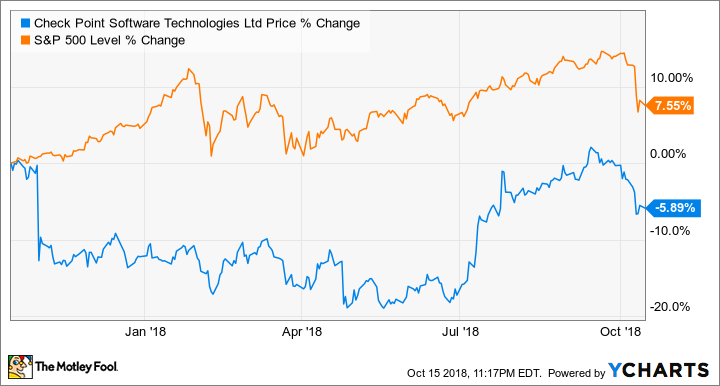 Check Point Software Technologies (NASDAQ:CHKP) is dawdling even as the broader cybersecurity market is growing at a solid pace. The cybersecurity specialist has been more concerned with share buybacks and growing its bottom line, even as rivals are turning up the heat to get more customers. Not surprisingly, Wall Street has been disenchanted with Check Point over the past year. Its stock is down over the past 12 months. However, the stock has found some momentum of late thanks to BTIG analyst Joel Fishbein's upgrade. The analyst wrote in July, just before the company's second-quarter earnings report, that "it is now time to get constructive on the name again;" Check Point seems to have bottomed and its sales force is now "more effective." The good news is that investors won't have to wait long to see if Check Point is making progress, as it will be reporting its fiscal third-quarter results on Oct. 24. Here's what the company needs to deliver to keep up its newfound momentum. Check Point Software's recent rise has been helped by the company's second-quarter results, reported in July. Its top and bottom lines were at the higher end of its guidance range, though growth wasn't robust. Its revenue was up just 2% year over year thanks to the company's transition from product-based sales to subscriptions. Non-GAAP net income also grew a paltry 2% compared to the prior-year period. The situation could be similar this time, as Check Point's third-quarter revenue is expected to increase just 2.5% year over year to $466 million. The company is expected to deliver earnings of $1.36 per share as compared to $1.30 a share in the prior-year period. Check Point shouldn't have much difficulty in meeting expectations. The company has doubled its share repurchase program to $2 billion, and this should support its bottom line. Part of the weakness on the top line is due to the company's move toward a subscription-centric model. Product-based revenue is usually recognized upfront, while subscription revenue is recognized over a period of time. Investors have been willing to give Check Point a long leash as it makes this transition, however, the company needs to show that it can accelerate its growth. Can Check Point inspire confidence? Though Check Point has been growing at a snail's pace, there are indications that its growth could speed up in subsequent quarters. For instance, the company signed 58 transactions that were worth $1 million or more during the second quarter. The total value of such large transactions increased by $50 million on a year over year basis during the second quarter. This boosted Check Point's deferred revenue by 9% annually. However, the company claims that there were "some large multi-year contracts that were not fully invoiced," so they were not recognized as deferred revenue. Investors will be watching the deferred revenue metric in this month's report closely. The good part is that Check Point now has the tools to lock customers into long subscription contracts thanks to its Infinity Architecture, an end-to-end cyber-defense platform. Check Point believes that Infinity is the only cybersecurity architecture that can protect users against so-called fifth-generation cyber attacks. The company's own surveys reveal that just 3% of enterprises are equipped to handle the latest generation of cyberattacks, which usually take place on a large scale across different devices using advanced techniques. Check Point believes that the advantages of the Infinity Architecture are helping it attract more customers across several verticals, though the company also points out that deals are taking longer to materialize. Check Point recently highlighted that its sales execution is tracking ahead of expectations. If that's indeed the case, then it should report stronger deal activity when it releases quarterly results. That would go a long way toward assuring investors that Check Point is capable of accelerating its growth, which will eventually give the stock a nice shot in the arm.